hey.. im a blogger, too!!! I am almost ten months old and I lovvve sleeping with mommy. How could they even think that I will sleep alone in my crib where monsters have direct access to me? This way, they have to fight through snoring daddy and drooling mommy to get to me! And trust me, they seem to wake up pretty fast. All I have to do is stick my finger up daddy's nose or pull a lil strand of mommy hair and they stir. Surely, monsters will be much more tough on them! And that means that I will be much more safe. Moreover in a crib, I spend atleast 30 minutes crying and then some time playing with that Dino who can only sing the alphabet song in every nap schedule. And in mommy-daddy's bed, I wake up to grumpy faces trying their absolute best to put me back to sleep. I cant help but smile and play at that. Well, who can blame me for that? The best part is that this bed is much more softer and has no rails that makes it like a prison. And the pillows. Ohh, the pillows and cushion-y soft comforters. Wowie. It was just yesterday that I kissed daddy awake. He kept telling mommy that I licked him awake at 5. But hey, that guy doesn't know everything. He still has facial hair which I know for a fact falls off as you grow up! But there are cons to this whole adjustment - mommy just doesn't stay still. All I ask her for is to not move through the night. But does she listen? Ohh God, no. She keeps moving her hands and turning around and sometimes even breathes into my neck. And then complains about me in the morning.Trust me, I am the troubled one here. Once I figure out rolling my tongue and saying those words aloud - they will know. I should infact add this to the list of a million things I have already jotted down to tell them then! They better watch out for that day!!! Pregnancy is a beautiful part of life. And now that I no longer have a big tummy obstructing my view of ground beneath my feet, I am sure to miss a few things about it(and there are other things I can always live without and do not want to make a note of!). Let me try and make a list. These days I live by lists and checklists and looks like this habit is here to stay. But then life is not a bed of roses. It will take you ultimately to this beautiful looking section of the hospital.This section is aptly named. This is no picnic place however well they look after you. It's true labour which happens here, and working on the fields is better any day. There were moments when I thought it was the end, not of the delivery process but you know, 'The End', like when they put me on oxygen when my blood pressure went low. And boy, didn't I work hard!!! And that too having nothing but just pieces of ice for a little more than a day. Anyways, after pushing, crying, screaming, silenced, shouting at hubby, pleading looks at the nurse and praying like never before - all in 25 hours, I could hear a loud squeaking(which is called crying) and I became a full-fledged mom - to a sweet little handsome guy. I call it 'full fledged' because until then there was no diaper changing or consoling a crying baby. Just carrying around(take my word for it, its much easier that way however bad you puke!). Looking after him is no small thing and it took me a couple of days(and nights, oh yes, nights) to accept the fact that such a small one can cause sooo much work(and noise, I should say noise). Dirty diapers, sweet smiles, loud 'hawa ka jhonka', small hugs, pursed lips, loud cries, cute to watch stretches and sooo many other magical(and not so magical) moments. I now know that every single gesture which comes from your baby is special. And after overcoming the initial fear and pain, the mom in me is now wide awake even when I am deep asleep. Yes, look out world. New mommy is in town. 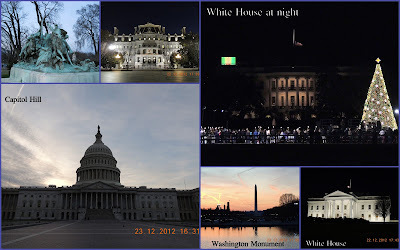 A trip to 'The District' - Capital of the U.S.
'To go or to not go' - that was the question which haunted us in the most important of cold December weekends. Yes, the one right before Christmas. And you can guess what the decision was. Off we went on a fine Saturday morning to Washington D.C, the capital of United States, often referred to as "The District". One of the benefits of braving the weather at this time of the year was that we got to see the National Christmas Tree placed near the White House. The tree was all decked up and was indeed a pretty sight. There are smaller trees each representing U.S states all around the national tree, and altogether it makes a very bright Christmas Scene. 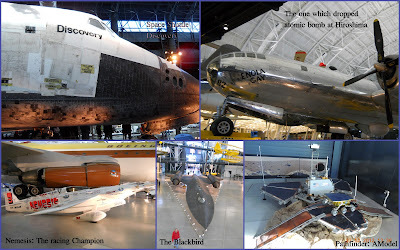 We set off the next day to Smithsonian Udvar-Hazy Air & Space museum. To be completely honest,I should say that this was the very first time that I actually fell in love with a museum. Museums to me have always been places with a lot of things that might accumulate dust but never much interest. Boy, wasn't that about to change. This one was a refreshing change. It was amazing with a hanger inside displaying all sorts of planes, helicopters, space shuttles, missiles, transmission equipment and what not! We got to see the space shuttle Discovery(and mind you, this was the real one which went into space, not a model), Enola Gay - the aircraft to bomb Hiroshima in Japan(the atomic bomb - Little Boy), Nemesis - the racing champion and a lot others including the ones used in World War 2. And flights were not all. There were missiles, maneuvering equipment, a model of Pathfinder(yes, the one which went to Mars and we read about in newspapers) and even an air traffic control room where you could listen to real transmissions from Reagan airport. Trust me, a trip to D.C will not be complete unless you dedicate a fair amount of time to this awesome place. We drove by Washington Memorial(entrances closed after a recent earthquake) and off we went to the U.S. capitol, which until then I would have recognized(wrongly) as White House. The dome looked inviting and as we walked around it, realized that it was indeed an architectural marvel. It was picture time what with tripod setup and everything there. Infact, most of these places were not much crowded, one for Christmas and one for near-freezing temperatures. By then, it was getting dark and we drove around the city for another closeup look at the White House. Ofcourse, we couldn't find any parking spots and had to be happy with driving all around the city(same can't be said for Renjith who was driving then, driving in D.C., the city, can be a real pain!). And before we knew, it was time to come back. We have been planning this trip to New Hampshire forever, but something or the other comes up and this plan gets dropped. But not the last weekend. On Thursday, we booked a hotel(one of the very few available) and set out on Friday evening for a 'colorful' weekend. On the first day, we started our journey with a trip to Franconia Notch State Park. There are multiple attractions there, but the best of the whole lot were the roads. Nature presented a plethora of colors on both side and each side-road would take one to simply beautiful woods each of which looked like an award winning painting(not modern art, thou!). We decided to check out The Flume Gorge as 'Gorge' was a word only familiar to us from Geography textbooks until then. It was a 2 mile hike each way along wooden steps/paths by the side of the waterfall and all the way up. It was like backtracing a waterfall in a blackbox manner ;) The view from the Sentinel Pinewood Covered bridge and other scenic views made the trail an even more memorable one. The road finally led us to Mount Washington Auto Road which in turn led us to the summit of Mt Washington. The drive along pretty steep and narrow road without any rails by the side took some daring from the part of hubby, especially towards the summit where it was all fog and frost. A chill went down my spike when I saw ice flakes around and thoughts about impending winter was, to be honest, a little scary! As we drove down, and stopped for another scenic overview, realized that it was time to get back to NJ. Oh yeah, I felt sad!!! More than what we saw, remains unseen and as we bid goodbye to New Hampshire, realized that this is a place we wouldn't mind coming, how-many-ever-more times! Live free or Die, says this state!!! 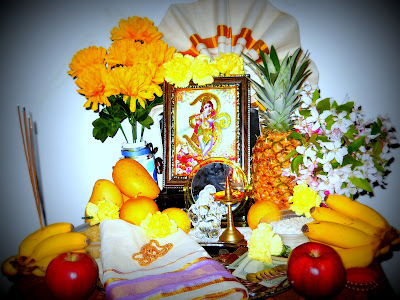 Vishu is around the corner and am about to get into a panic driven state. I am one who truly believes that the better the Vishukani, the better the year ahead. And this year, I have no clue about what is in store for me! And the fact that we are in the States does not help either. I decided to start with a picture/statue of Lord Krishna. And on a rainy(and cold) Sunday evening dragged hubby darling through a bath and set off to ISKCON. It was nothing like what I had imagined(do you remember those rows and rows of shops in ISKCON Bangalore?) except for the kavi-clad 'sayips' and 'madammas'! I was really happy that we had a plan B in place and started off to Bridgewater temple. There, I could see a small store near the entrance and a super-duper-happy me rushed through the Darshan and dashed to the store(without even waiting for the Prasadam, which is otherwise a highlight!). But only to see a 'closed' board hung over it! I was kind of sure then that I will have to make do with the small pic I had carried with me. But hubby had a better plan. During our drive to Philly, he stopped at the temple again and this time we went straight to the store and it was indeed open, much to our delight. Incense stick(Agarbathi) time! This one wasn't all that difficult. Though selecting between cinnamon/vanilla/chocolate/strawberry flavored incense sticks was a new experience. Should say that I enjoyed it though :) Check. And now for yellow fruits and veggies. A trip to Indian grocery store covered the whole part, and I even bought a couple of apples and a box of strawberries to liven up the occasion. The sad part was that while in the checkout line, I saw this big piece of jackfruit with this old uncle who was directly in front of me. I couldnt stop myself from asking where he found it. As I rushed to the stand he pointed, got to know that they had run out of it. A sulking me came back to the line and stole another look at the jackfruit this uncle had, wondering how close I had been to having a jackfruit for my kani. What I do not understand is why he immediately took it out of the basket and carried it like I might steal it and run away, or could I have??? We were a part of the crazy SMS maniac campus generation. Thanks to service providers like Airtel and Aircel, ours was controlled frenzy. The maximum number of free SMSes per day was limited to 100 for student pack. And for those who think that 100 is a good figure, trust me, it wasn't. To survive a long day of boring lectures and that too with the numerous gossips floating around, it was actually too less. I remember the day when I woke up to my best friend/roomie promising me my ever fav Diary Milk. I realized that something was up since she is not this sweet, usually. And the reason became quite obvious in a few minutes - my free SMSes for the day were done for, and the day had not even begun! Moreover she didn't look like she had lost her sleep!! Those are the figures we are talking about. Hope you get a picture now. SMSes helped classmates let the late comers know what was in store for them, or if the lectures had been shuffled (so that you can plan and avoid a particular subject for which you already have enough attendance). For cross-department friends, it was absolutely necessary to synchronize their bunking. And while in auditorium, who doesn't like a well coordinated booing? And most of all, it made one feel like a hero(ine) for mobiles were banned in the campus. There was a friend of mine who had made a storage closet for a mobile on her notebook. She had carefully cut a neat dwelling fitting her phone in one notbook, and one befitting the charger in another. Such were the ingenious methods devised to smuggle the phone in and out of the college hostel and to charge them inside empty classrooms. Not to mention the numerous funny, crazy, and chalu forwards, silent sorries, fights and as my friends recently reminded me, pranks! One of us once received a forwarded message. What made it special was that it was sent by a spirit(or so it claimed!). All we had to do was to give a missed call to a number at night, and the ghost will call you back at midnight. And well, the courageous ones gave miss calls, and midnight swept by without anything happening. But the phone did ring, early in the morning. As we picked the call all so scared, there was a guy at the other end of the phone shouting and screaming. He was indeed blood-thirsty, caused by the fact that he received numerous miss calls during the night spoiling his sleep! And oh, this will not be complete without saying about messages gone astray. How would you feel if a gossip about you landed rght on your inbox? Well, definitely not an intended gesture, but a small 'spelling' mistake :) The consequences depend on how well you manage it at the moment, and of course, on your luck. I really really do not want to explain more. This is my space.. in software engg terms, one where I try to map my feelings.. Welcome aboard, and hope you enjoy staying here!! !